The Golden Acrylic Lecture is a fun, fast-paced informative 2 hour lecture covering a technical review of acrylics and their varied application possibilities. 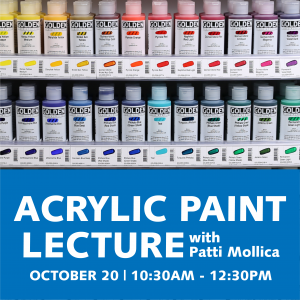 The lecture will present information on pigment types, characteristics, heavy body, fluids, OPEN paints, gels, mediums, pastes, iridescents, and much more. Learn how acrylics can be used as grounds for other media, such as oil, watercolor, pastel or colored pencil; get key information on color mixing for brilliant hues, blending and controlling drying time; see how gels can be used to modify paint properties or create unique textural surfaces. From traditional to contemporary to mixed media, acrylics are infinitely versatile. Artists of all levels will come away from this lecture demo with fresh new insights to feed their creative expression. This lecture will be at Hull’s Second Story Gallery + Workshop, upstairs from Hull’s Art Supply + Framing.